Abita's Big Beer series is the company's showcase for bigger (duh) and more artisanal beers. Earlier this year I reviewed Andygator,and now with Abbey Ale, we can complete the set. 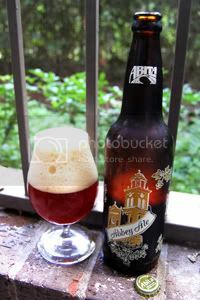 Abbey Ale is a Dubbel and is actually the first example of the style to be featured on PintLog. Traditionally a Trappist style, the Dubbel sits above the Enkel (now generally known as "Blond") and below the Tripel in the typical Trappist lineupThe BJCP guidelines sum up the style as "a deep reddish, moderately strong, malty, complex Belgian ale." Dark amber in color, the aroma of caramel, fruits and cloves invites you to contemplate the creamy head of this "Dubbel." Abita Abbey Ale is a malty brew, top-fermented and bottle aged to rapturous perfection. Let's get started and see if this brew is a saint or a sinner. Appearance: A moderately hazy deep reddish-brown body topped by a very generous cap of pillowy off-white head that sticks around a long time and leaves great lacing. Aroma: A sweet and rich mix of dark fruit, molasses, caramel, slight nuttiness, dark bread, and mild spiciness. Taste: Up front, sweet and toasty malt with a caramel and burnt-sugar character that turns chocolaty towards the end. Accompanying the malt are mild, herbal hops and plenty of Belgian yeast with an earthy clove character. Mild alcohol towards the end segueing into a yeasty and raisiny aftertaste. Mouthfeel: A thick body with smooth carbonation and a dryish finish. Drinkability: With the full body, bold flavor profile, and moderately-high alcohol content, this comes close to sipper territory. Verdict: It may have a hard time competing with the Belgian originals, but Abita have brewed up a pretty damn decent Dubbel here. Just watch out for the well-hidden alcohol punch.